Mox and Mitsu, owners of the huge Supercute Empire, find themselves under attack by their bitter rival Moe Bennie. For years they've dominated their ravaged world by having the cutest clothes and cuddliest toys, but now they're obliged to revert to armed violence, something at which they're surprisingly adept. 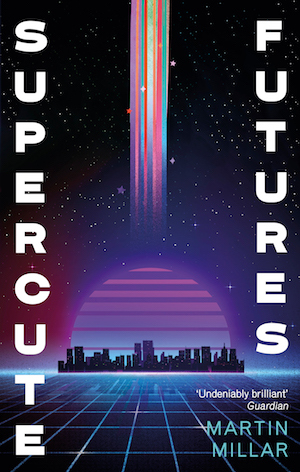 Faced with an overwhelming cyber-assault, hostile drones in the air and mercenaries in the radioactive tunnels below, Supercute are desperately struggling to stay alive, with their empire intact and their make-up in good repair. Mox and Mitsu dropped over a wall into the basement of an underground car park. A large, friendly frog waddled towards them, wearing a parking attendant's hat. Mox and Mitsu shook their heads, and hurried by. 'I never really liked the friendly frog,' said Mox. They halted behind a pillar, checking their screens for any signs of armed enemies. More than half of the overhead lights were out. They crept forward through the semi-darkness. Mitsu crawled behind a barrier, nudged Mox, and pointed. Just ahead, with their backs to them, were two men in military fatigues with their weapons pointed at the ground. 'Load unarmed combat skills,' Mitsu whispered. Mox did the same. They vaulted over the barrier and sprinted towards their enemies. Mitsu dealt with her target in seconds. Taken by surprise, he stood no chance against her advanced body, driven by the combat skills program now assisting her movements. He slumped unconscious to the ground, his rifle clattering on the tarmac. Mitsu whirled round, expecting to see Mox dealing with her opponent with similar efficiency. Instead she saw her struggling to hold off an enraged foe. He threw her to the ground with ease and raised his boot to stamp on her. Mitsu leapt to her assistance, preventing the boot from landing and then dealing him several crippling blows in the space of a second. He fell down unconscious. She bent down to help Mox to her feet.